Our Monthly Wood Fired Pizza night. 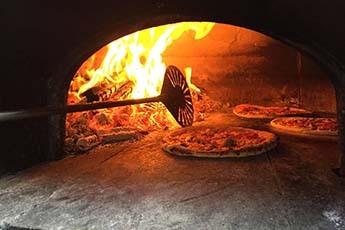 Once a month, Broken Tree Pizza sets up their mobile wood fired pizza oven and cooks up made to order pizzas special for YOU! The menu changes monthly and the cost is $14 per 10″ pizza. Multiple dining areas are available; The Loft (our barn), Holly’s Wine Garden (the patio) the Grapevine Pavilion, plus lots of outdoor seating areas among our spacious grounds. Wine, beer, mixers and soft drinks are available for purchase. We only accept reservations for groups of more than 12 and pizzas are sold on “first come, first serve basis” in order to be fair to everyone. Please please, please, please PEEPS please understand that although Broken Tree Pizza cooks pizzas late into the evening, if you arrive & are told they are sold out, that means a very large number of people arrived & placed their orders before you got here. We really don’t need a “melt down” (SERIOUSLY) because we are sold out. It does not mean they are already done cooking pizzas. To be fair to everyone, we DO NOT pre-sell pizzas before we open our doors. Pizzas are “first come, first serve.” If they sell out before you arrive, why not have a glass of wine and relax with us. We also offer light snacks. When peeps lose their temper & swear at us and/or threaten us because pizzas are sold out, it makes us feel as though we should no longer host pizza nights. Thank you for understanding!